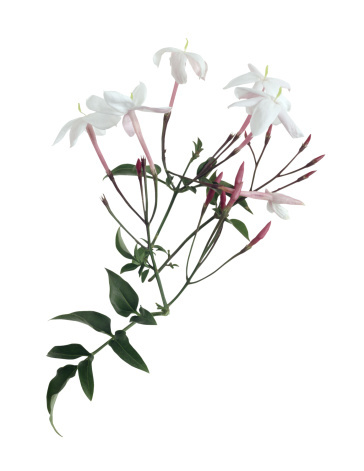 Few plants can match jasmines (Jasminum spp.) when their delicate, intensely fragrant flowers arrive in spring. So it can be quite disappointing when the flowers fail to appear. There are several potential reasons why a jasmine fails to bloom and several simple ways to resolve the problem. Jasmine is hardy throughout U.S. Department of Agriculture plant hardiness zones 6 through 11, depending on the species and cultivar. Most kinds of jasmines need warmth -- temperatures higher than 65 degrees Fahrenheit -- to grow and flower, although some tolerate cold. Temperature is closely tied to flowering in jasmine. Pink jasmine (Jasminum polyanthum, USDA zones 8 through 10), common jasmine (Jasminum officinale, USDA zones 7 through 10) and winter jasmine (Jasminum nudiflorum, USDA zones 6 through 10) all need cool winter temperatures to induce flowering. Nights that are 33 to 55 F are ideal for their flower development, although they also produce flowers when nighttime temperatures are 56 to 59 F.
When flowering is lax in your jasmine, monitor the temperature surrounding it. If it is an indoor jasmine, move it into a bright, unheated room or partly heated greenhouse where the temperature dips below 55 F during winter months, which will help to induce blooming. Few options are available for an established, outdoor jasmine that fails to bloom due to warm temperatures. Transplanting it to a cooler area of the garden is best, but the move may stress the vine and delay its blooming even further. Prune in late spring after the jasmine flowers to encourage lush growth and prepare the vine for flowering the following year. Prune again in late summer to eliminate scraggly growth if desired. Do not prune after late summer. Disinfect your pruning shears in an undiluted household disinfectant before using them. Soak the blades in the disinfectant for five minutes, rinse them with hot water and let them air-dry. Repeat the procedure when you finish pruning. Poor nutrition wrecks havoc on heavy bloomers such as jasmine. Both too much nutrients and not enough nutrients have a deleterious effect, but their signs are slightly different. Excess nitrogen encourages the production of foliage instead of flowers and roots while a nutrient-starved jasmine grows slowly and develops yellow foliage. Dark-green leaves and leggy growth indicate too much nitrogen. Withhold fertilizing the jasmine for one month. Then feed it a water-soluble 7-9-5 fertilizer, which will boost flowering. Dissolve 1/4 teaspoon of the fertilizer in 1 gallon of water, and apply the solution weekly during the summer months in place of a regular watering. Sluggish growth and yellow leaves can mean too few nutrients. Feed the jasmine with 1/4 teaspoon of a water-soluble 15-15-15 fertilizer diluted in 1 gallon of water. Apply the fertilizer solution weekly from spring until late summer in place of a regular watering. Discontinue feeding in winter. Pruning back overhanging shrubbery to increase light exposure for the jasmine. Disinfect the pruning tool before and after its use, and remove the overhanging growth in stages over the course of one week to acclimate your jasmine to stronger light. Moving a potted jasmine closer to a south-facing window with six to eight hours of sun exposure each day. Rotate the pot 90 degrees each week to ensure even light exposure on the plant. What Does Jasmine Smell Like? Why Does My Jasmine Plant Look Dead After the Winter?